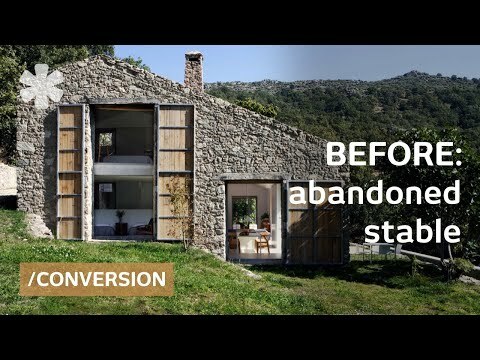 Located in a privileged environment in the province of Cáceres, the goal was to transform an abandoned stable into a family home by completely renovating it in a way that would be consistent and respectful with the environment. At the end, the Studio decided that building from scratch was the best option as the stable was in a terrible shape. High on a hill and far from city water or an electrical grid, a thorough investigation resulted in the addition of photovoltaic and hydro power (weighted toward solar in summer and hydro in winter) and worked to ensure the home wouldn't use much energy. The building's original orientation also helped as southern exposure allowed for the sun to be the main source of heat during the winter. A generous eave prevents much sun from entering the home during summer, thus keeping it cool. Large wooden shutters that slide closed like a second skin, cover the large windows at night to trap in most of the home's daily solar heat gain. As the building is located far from city water but perfectly located below two streams that flow year round the water is pure and can be used for drinking and bathing. The swimming pool acts as a holding tank for use in irrigation. In the interior nature has been incorporated almost to every room in the house: bathrooms with views of the interior patio and its stone water fountain, bedrooms with huge picture windows overlooking the countryside. The position of the architecture is as it was originally and the material used are also the same though given the home's crumbling state the façade was built with a mix of cement and local stone.In the interior, supporting walls were replaced by light metal pillars, the haylofts in the upper area were converted into bedrooms and the enormous central lounge serves different purposes. In short, a mix of modern cement and iron beams coexist with well-worn stone, weather-beaten wood and local stone.